Note: this game is a work in progress and can change before the full release. I decided to put a full review for this rather than write in the early access section as it can be played from start to finish. Serving fantastical cocktails and drinks to cyberpunk customers in a futuristic sci-fi world sounds like an exciting and intriguing endeavour. For the most part this rings true in VA-11 HALL-A Prologue, an introduction to the upcoming full game, but the somewhat limited nature of your cliental hinders the potential. VA-11 HALL-A was originally made in forty-eight hours as part of Itch.io's cyberpunk jam. The developers then decided to develop the concept into a complete game. 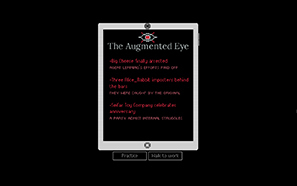 You can still play the prototype - it comes with the purchase of the prologue or you can download it for free from the same page – and I highly recommend that you do. It is short but focused and to the point. You meet a few characters and upon serving them their desired beverage they will engage in some conversation (unless you totally mess up their drink). It is a good way to test out the game if you remain unsure. 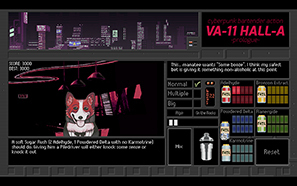 There are several immediately striking components to VA-11 HALL-A Prologue. The character designs and overall art are fantastic and contribute to the cyberpunk feeling considerably. Along with this the fabulous soundtrack (from which you pick a song to start each day with from the jukebox) completes the atmosphere surrounding the game. Characters occasionally subtly animate, reflecting their current mood or reaction to a drink or a conversational topic. The gameplay feels like a cocktail (see what I did there?) of Papers, Please and Cook, Serve, Delicious. Characters will order a drink and through text instruction you are given the exact recipe for their desired drink. This being a dystopian future there are different names for spirits and substances used in bartending now; Adelhyde, Bronson Extract, Powdered Delta, Flanergide and Karmotrine are at your disposal. You may need two units of Adelhyde and two of Bronson Extract with the rest made up by Karmotrine to make the drink. With a standard shaker you can use up to ten units, while with the big one you can use twenty. There is also an option to make two drinks for the one order. There are options to age the spirits, have it on the rocks, mix and blend. These combinations keep the gameplay fresh, though there isn't much challenge in making these drinks. No time limit hastens you and the instructions are always on the screen. I would have liked it if there was a recipe book that I'd have to look at in order to learn the ingredients for each drink. It would have provided a greater challenge; having to memorise them or write them down. Plus, given the art direction I bet it would look fantastic. 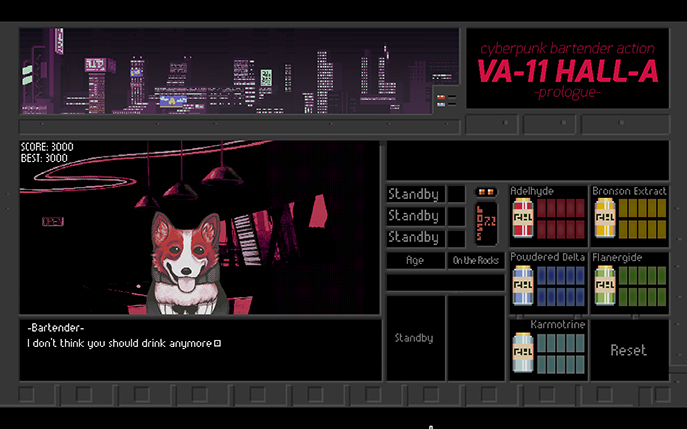 Conversation and learning about your customers plays an equally important in VA-11 HALL-A Prologue as serving the drinks themselves and this is where the game both shines and falters. The conversations play out without your input, there are no reply selections or dialogue trees. The writing is mostly excellent and some sentences and responses made me laugh out loud. Some of these customers are also interesting, and learning about their lives, opinions, past and experience is an engrossing part of the game. The characters that are fleshed out are done so very well. The problem is, there aren't many of them. The bar has been booked for three days by a company and is closed to the public. This company makes dog toys – they are the second biggest dog toy company in the world – and nearly 100% of their staff are corgis. The breed of dog. They wear translators and have a good business acumen but are not fleshed out as characters. Each dog that you serve has identical art with a palette swap and will engage you in very brief conversation before ordering the drink. Admittedly, some of these are very funny (especially the mirror confusion), but you'll encounter the same dog and text several times during your play through. The dogs will come to the bar in random order but the repetition becomes very tiresome. 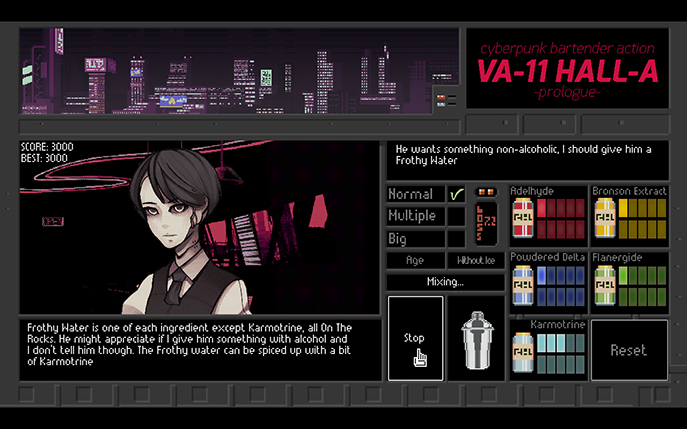 The problem is that VA-11 HALL-A Prologue doesn't convey the ideology of the bartender. You'd meet many new people for fleeting moments each day; some will tell stories, some will not. Some will be pleasant, some horrible. You'd learn new things, get an idea of the local culture and how the world works. It feels like nearly all of that is missing. The corgis appearing in random order and re-appearing with identical text cheapens their character but you really get to know the two main human(oid) characters. The prologue concludes with a cliffhanger that suggests there may be more pressure on the player in the final game. So far there are no time limits in making drinks and everything is spelled out for you. The only punishment for serving a drink incorrectly is fewer or no points gained. This isn't a huge deal but it would be interesting if there was a little more challenge. I had a lot of fun in the first half of VA-11 HALL-A Prologue but grew frustrated with the repeating cliental and the slow pace of this repetitive nature. Learning about Deal and Betty was great and executed well, but was too often interrupted by the corgis and their dialogue I had already read. The presentation is fantastic; the atmosphere created by the art, characters and music had me really engrossed the whole game. I would really suggest picking up the soundtrack edition of the game, it's about £5 and I've listened to it whilst working several times since playing. There is a lot of potential for the final game on show here but I hope they expand the cliental and increase the challenge. 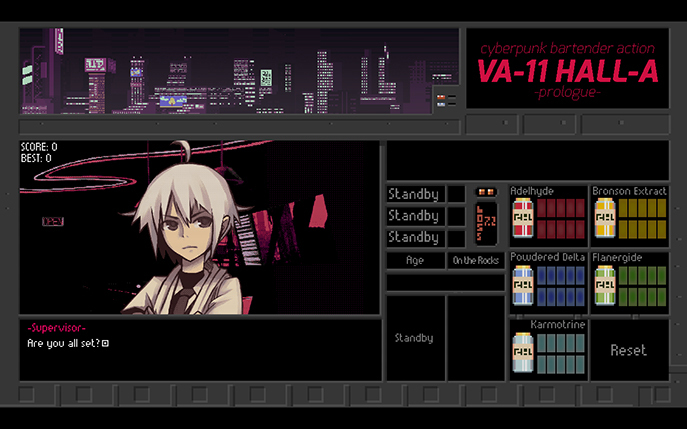 It is worth playing both the prototype and the prologue to get a taste of VA-11 HALL-A's world. I am very much looking forward to the full release. + Characters are very well written but..